Thank you for checking out this book by Theophania Publishing. We appreciate your business and look forward to serving you soon. We have thousands of titles available, and we invite you to search for us by name, contact us via our website, or download our most recent catalogues. 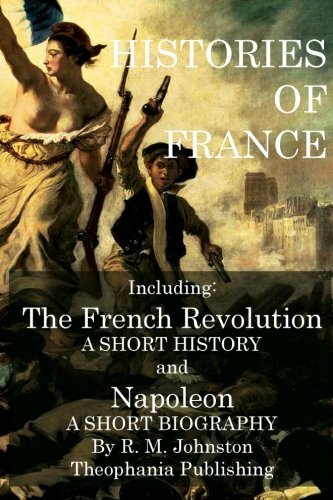 The object of this book is similar to that with which, a few years ago, I wrote a short biography of Napoleon. The main outlines of the Revolution, the proportion and relation of things, tend to become obscured under the accumulation of historical detail that is now proceeding. This is an attempt, therefore, to disentangle from the mass of details the shape, the movement, the significance of this great historical cataclysm. To keep the outline clear I have deliberately avoided mentioning the names of many subordinate actors; thinking that if nothing essential was connected with them the mention of their names would only tend to confuse matters. Similarly with incidents, I have omitted a few, such as the troubles at Avignon, and changed the emphasis on others, judging freely their importance and not following the footsteps of my predecessors, as in the case of the capture of the Bastille, the importance of which was vastly exaggerated by early writers on the subject.